Hello! 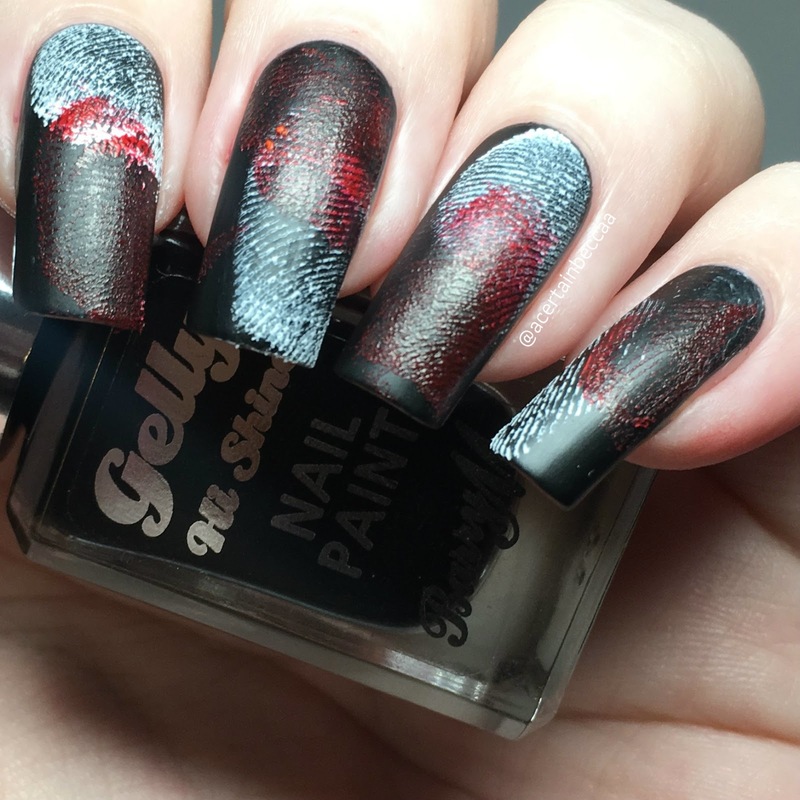 Today I have a fun post in collaboration with Barry M. They kindly sent me a selection of their polishes perfect for creating Halloween looks. These included their newest Molten Metals (swatched here), and 9 other various shades (swatched here). 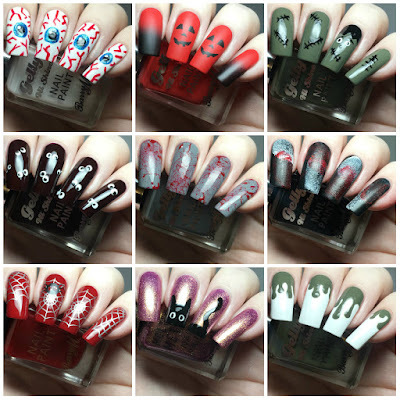 I used them to create nine Halloween manicures in total. Read on for a closer look at each one and more info! First up, I decided on eyeballs. I started with a base of 'Cotton'. 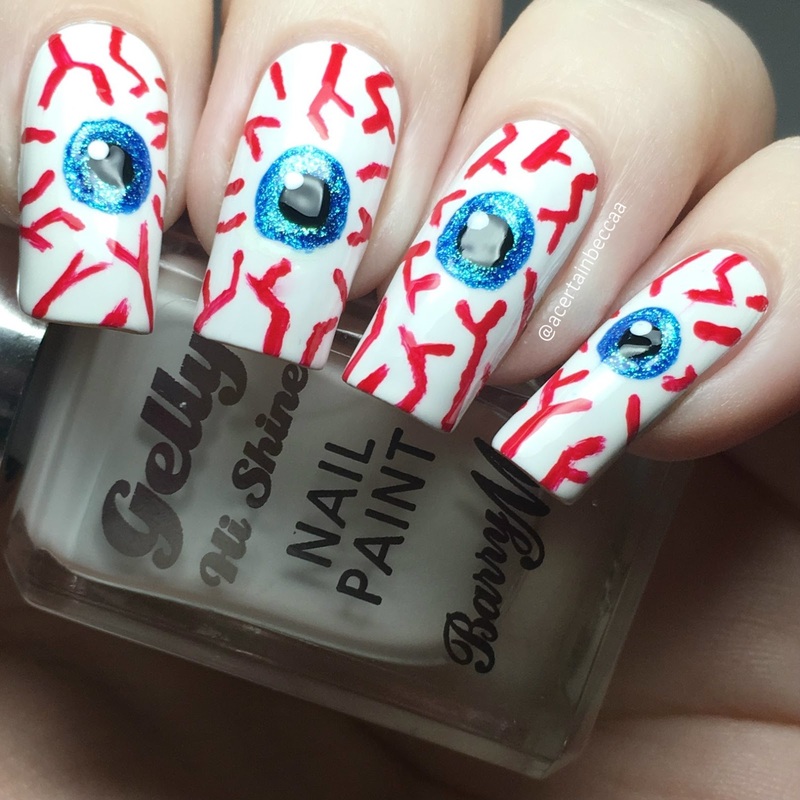 To create the eyeballs themselves, I added a large circle of 'Crystal Blue' to each nail, followed by a smaller circle of 'Black Forest', and a dot of 'Cotton'. I then added random red lines using 'Blood Orange' to create the bloodshot look. Next, I went for pumpkins. I started by painting all of my nails with 'Passion Fruit'. I created a gradient of 'Passion Fruit' and 'Black Forest' on my pointer and pinky nails. 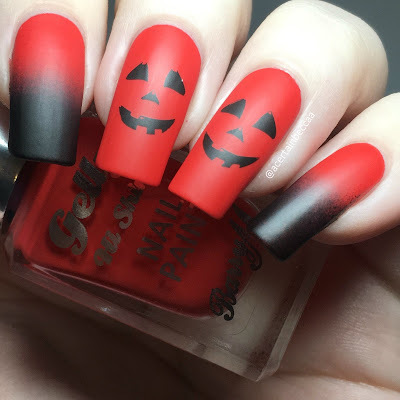 I then added black pumpkin faces to both of my middle nails. I finished off with a coat of Barry M's matte topcoat. Here they are before I added matte topcoat. Next I created a frankenstein mani. My base colour is 'Matcha'. 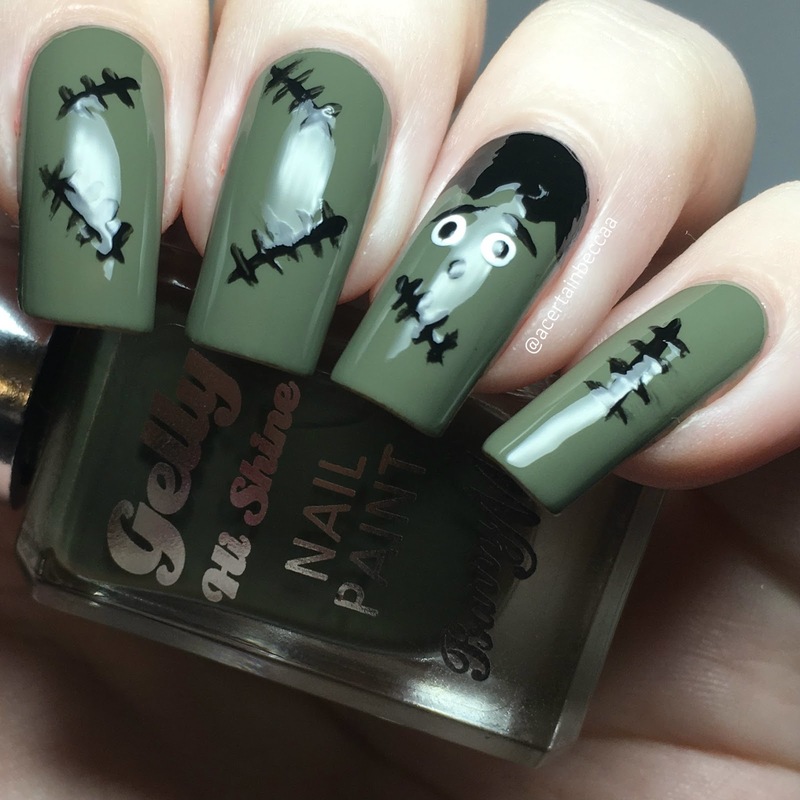 On my ring finger, I used 'Black Forest' and 'Cotton' to draw a little frankenstein, complete with black hair and a stitched mouth. On my other nails, I added roughly painted stitches. 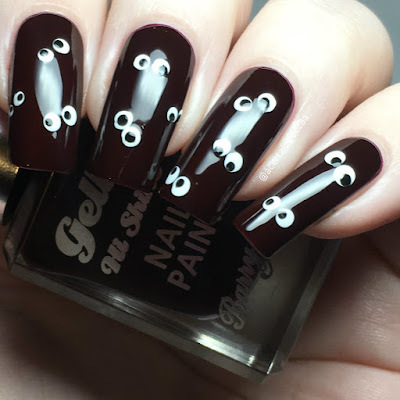 I then decided to do another eye mani, this time a lot simpler with lots of little sets of eyes as opposed to bigger ones. I used a base of 'Black Cherry'. I added dots of 'Cotton' followed by smaller dots of 'Black Forest' to create my eyes. Next is a blood splatter - one of my Halloween go-to's every year! I like to change it a bit each time, so this year I went for a grey base using 'Chai'. I then used a strawer to splatter 'Siren' over the top, before carefully doing the same with 'Blood Orange' to fill any gaps. Another one of my Halloween favourites is fingerprints. I applied Barry M's matte topcoat over 'Black Forest' for my base. 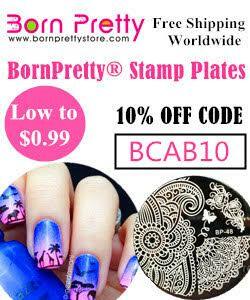 I then made actual fingerprints (by dipping my finger into polish and carefully pressing it onto my nails) using 'Cotton'. I then did the same using 'Siren'. Next up I went for a spider mani. I started off with a base of 'Siren' on all of my nails. 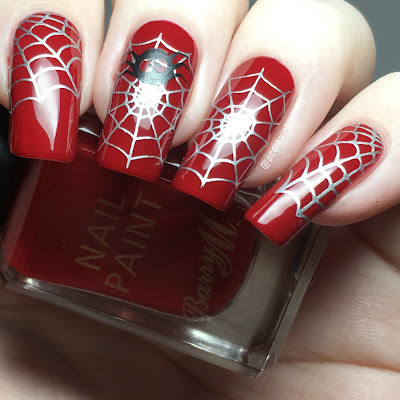 I then added spiderwebs to each nail using a Barry M silver, and a black spider onto my middle finger. 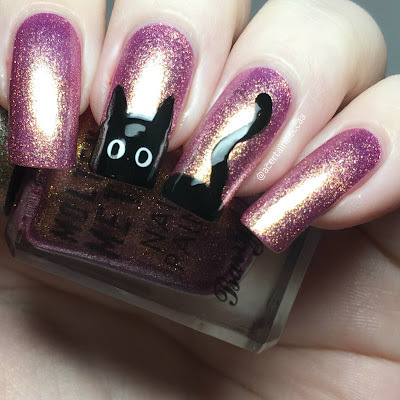 I wanted to do something a little bit cuter, so decided on a black cat mani. I painted cat eyes and ears on my middle finger, and tail on my ring finger, both in black using 'Black Forest'. My base is molten metal 'Pink Luxe'. 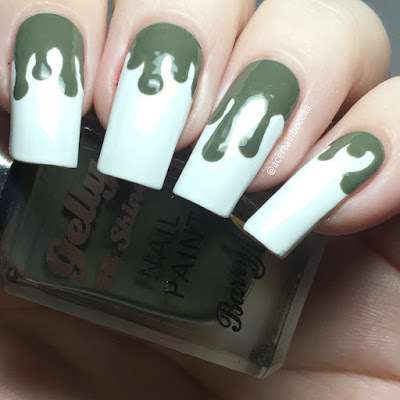 Finally, I opted for dripping slime. I started with a base of 'Cotton', and then painted my drips of green slime using 'Matcha'. 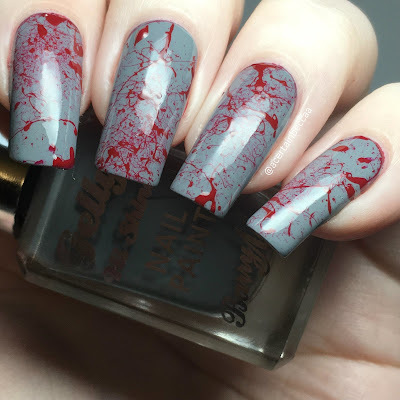 I do love the standard blood drip mani using red polish, but occasionally switch it up with slime instead. What do you think? 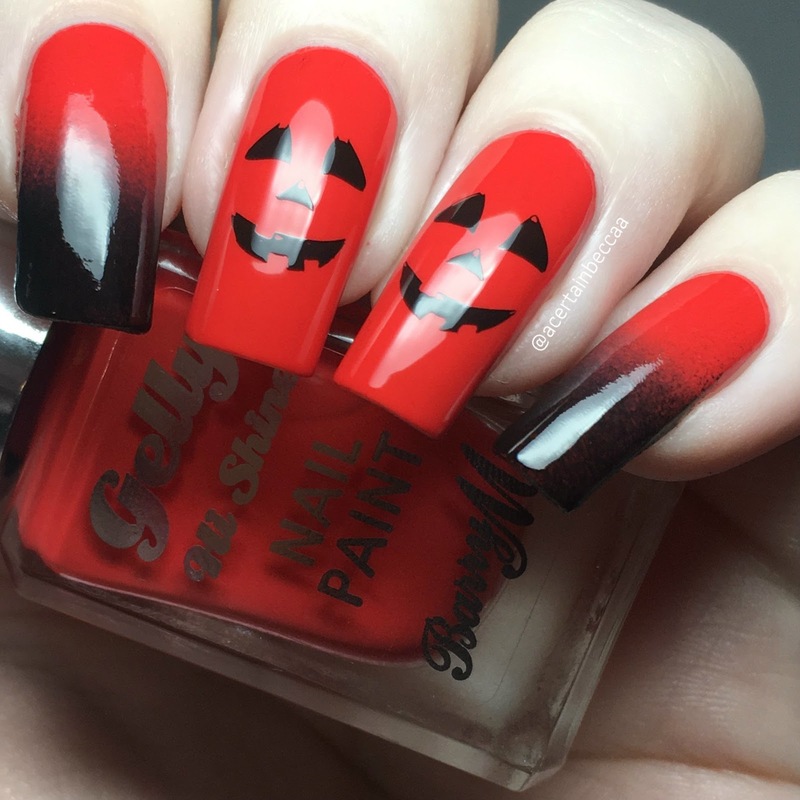 Halloween is definitely one of my favourite times of year for nails, it's just so fun! I would happily wear any of the manis above for the day itself, or even a mix and match of a few of them. I tried to stick to freehand and simple designs so that they can easily be recreated using the mentioned Barry M shades. You can find all polishes mentioned on the Barry M website here.